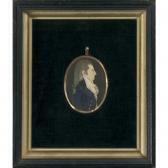 Find artworks, auction results, sale prices and pictures of Mary B. Way at auctions worldwide. Sisters Mary Way and Elizabeth Way (Champlain) were born into a New London, Connecticut, mercantile family just before the Revolution. 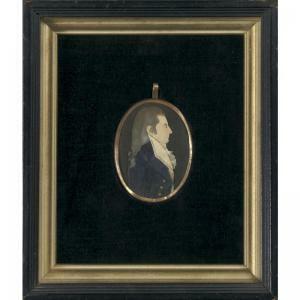 By the 1790s, when they reached their early twenties, both were painting miniature portaits of neighbors and relatives. Mary Way abandoned Connecticut for New York in 1811 at the age of forty-two. There she quickly worked her way into the fringes of a coterie of successful painters including John Jarvis, Joseph Wood, and Anson Dickinson, who critiqued her style and loaned her paintings to copy. 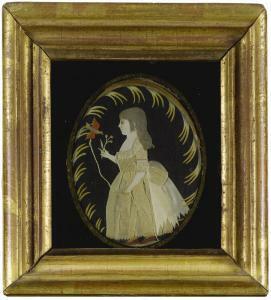 By 1818, Mary Way had attracted a significant clientel, drawing both from parishioners at her Universalist church and older New London connections; she advertised a "ladies drawing academy" in the New York papers and she had two miniatures on ivory included in the annual exhibition of the American Academy of Fine Arts. Mary Way was never a star in the city's art scene. And she never attained financial security. 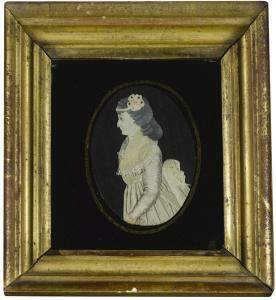 Still, when blindness ended her career in 1820, the Academy sponsored a benefit to raise money on her behalf. While no evidence survives to explain exactly how or when the Way sisters learned to paint, it seems probable that they encountered some sort of art instruction during stints at one of Connecticut's many female academies. 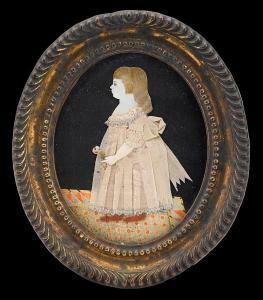 The combination of delicately painted faces, applique, embroidery, and fine decorative sewing recalls the elaborate needlework pictures that young ladies produced at the culmination of their schooling. Watercolor and fabric on cut-out paper, glued to a silk ground, pressed metal frame. By descent to present owner. 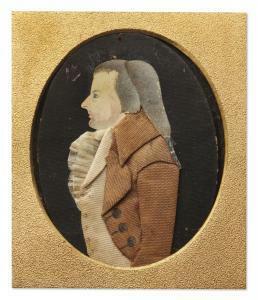 Scattered losses ( old insect damage) to fabric of dress below arm, some fading to carpet , minute losses of watercolor along outer edge of hair, the stamped frame matches those on the dressed miniatures by Way in the collection of the Lyman Allyn Museum, New London, CT.
. In 1811, Mary and Eliza moved to New York. Mary advertised herself at 95 Greenwich Street, as "a portrait and miniature painter" who could also paint "landscapes or views of country seats," and as a teacher of drawing. She remained in New York until 1820. She returned to New London, gradually going blind.